Does the thought of hours at the gym fill you with horror? You are not alone – and, you are in the majority. Fortunately research over the last few years is showing that we don’t all have to sweat it out for hours and hours. If you at a huge high-fat meal for breakfast, there will be plenty of fat floating around your bloodstream in the hours following the meal. BUT: If, in the previous 12 or so hours you engaged in some exercise the outcome is different. Science shows us that there will be a whole lot less fat floating around waiting to be stored somewhere. Exercise kicks your body into action. Health authorities (such as the CDC) recommend about 150 minutes of moderate intensity per week. The reality: About 80% of us don’t do this. What’s even more depressing is that we all respond very differently. About 20% of us are super-responders: If we do this exercise we will rapidly get fitter, burn fat, and get stronger. But for many of us, the outcomes are far from dramatic. All that hard work – and hardly any outcome. The good news is: very short amounts of exercise can have just as much benefit as much longer workouts. 30 seconds of an exercise as fast and hard as you can. This exercise protocol can bring as many gains as much longer workouts. In 2013, the ACSM came up with a “7 Minute workout”. Using body weight alone (no special equipment), this trained all major muscle groups. Their article reviewed all the research on High Intensity training and created an ideal workout. The NY Times explained it further. 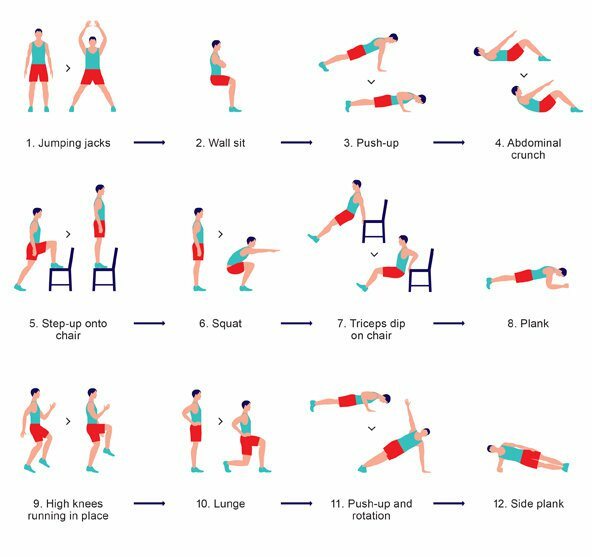 Do each of these exercises for 30 seconds, and then rest for 10 seconds after each exercise (total: 7 minutes). The health benefits are numerous: increase in subcutaneous fat loss, strength development, increased VO2 max (your body’s efficiency at using oxygen), improved insulin sensitivity (your body is much better at dealing with sugar). THE SECRET: Keep you rest periods short (10-20 seconds), and perform your exercises at maximum intensity. Note: If you are a beginner, you should consult a medical professional before attempting any high intensity training. See more workout plans and fitness programs.